Perfectly cooked roast beef is no longer a mystery to me. The roast turned out so beautifully, I can hardly wait to make another one and try some different flavors and seasonings. The meat was medium rare, tender and flavorful. This method basically turns a conventional oven into a convection oven and eliminates the need to turn the roast while it is cooking. I served this with smashed potatoes and green beans. It was a wonderful warm meal on one of our first chilly days this fall. Hurray for rainy weather at last! Start with your roast at room temperature. I removed mine from the refrigerator a little over an hour before I was ready to cook it. Preheat the oven to 375 degrees. With a sharp knife, make a tiny slit in the meat just large enough to slide a sliver of garlic into the meat. Repeat all over the roast, for each sliver of garlic. Drizzle olive oil on the roast and rub all over the sides. Sprinkle the entire roast with salt and pepper. Place the roast directly on the oven rack, fatty side up, with a drip pan on a rack underneath the roasting rack. Brown the roast at 375 degrees for 30 minutes. Lower the heat to 225 degrees. Cook the roast another 2-3 hours. When the roast begins to drip juices and has turned brown on the outside, check the temperature with a meat thermometer. 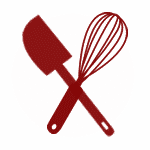 Carefully use tongs to remove the roast from the oven when the inside temperature is 140 degrees. Let the roast rest on a plate, tented with foil to keep warm, for at least 15 minutes before carving to serve. Enjoy! Woe, does this beef look perfect! My mom taught me the garlic trick...and I'm going to have to try your roasting method. Mary, I love that roasting method too. It works beautifully. Unfortunately, I have to leave out the garlic these days due to allergy. 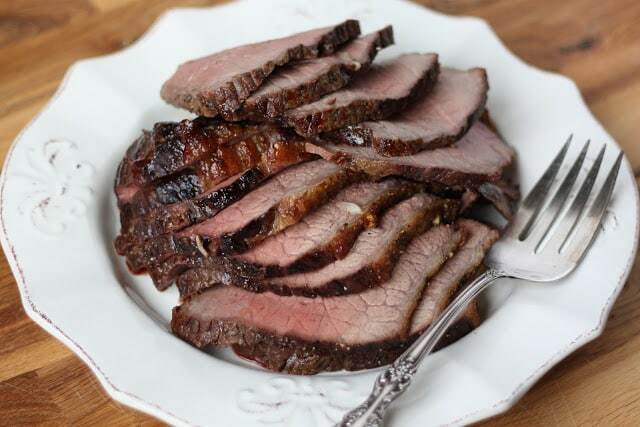 Love your photo--it can be difficult to make a plate of roast beef look good on camera! Where oh where are you finding meat with fat? In our area every scrap of fat is removed like it's poison. We are fortunate to be able to buy our beef from a local ranch. In the stores, it really is difficult to find a quality cut of meat. everyone remember to spray that rack with pan spray!!! I've never sprayed the rack and it always comes clean very easily. I imagine that could depend on the amount of fat in the meat. If the meat is leaner, it might be more likely to burn onto the rack. This looks delicious! But does it have to be cooked right on the rack, will cooking it in something make it not as good? Cooking it directly on the rack allows your oven to work like a convection oven. It definitely won't work the same in a pan. Wow This truly is my new favorite Roast Beef Full taste beautiful colour. Those look so perfect! Thanks you so much mam. I have a convection oven. Can I cook the roast on a pan and get the same results? What temperatures should I use and what would be the cooking times? 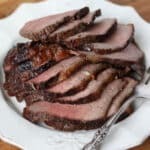 I cooked the Tri Tip Beef Roast it was very tender and had a wonderful taste. i did add vegetables....Thank you . That will work fine. It won't circulate quite as much air around the meat, but yes, it will work nicely.